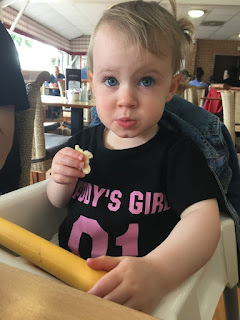 When Caroline first fell pregnant and told me I was going to be a dad I thought I had a vague idea of what I was getting into: nappies, sleeplessness, the usual stuff for a first-time dad, but oh how naive I was. There's so much I couldn't have planned for, especially with Mara arriving early. Here's a sampling of those surprises. 1. Baby poop can be multicoloured. And it's called "meconium." The official definition is "the dark green/black substance forming the first faeces of a new born infant." But that foul sentence doesn't come close to doing meconium justice. There's nothing to prepare a first-time dad for this, ahem, unique brand of poop. 2. Wherever you go, whatever you do everyone will give you their advice. A first-time dad is an internet comment section in human form, with the world and their Aunty offering their opinions about what they think is for the best regarding vaccinating, gender stereotypes, dummies, co-sleeping... The list is endless. Some people are genuinely trying to be helpful, others are downright rude and look down their nose at you when you dare to react in a way which displeases them. 3. Baby noises can be scary, but silence can be worse. For the first 5 weeks Mara was in hospital in the Special Care ward so she had round the clock care, but when we brought her home it was all on us! It wasn't her cries keeping us awake at night, it was every single gap of silence that had me out of bed to ensure she was still breathing. It took a couple of weeks for the silence to become serene and to be certain all her tiny noises weren't sounds of suffocation. This is where the Snuzahero comes in handy! 4. You'll end up with a stuffed toy collection to rival Build-A-Bear. Before long, your newborn child will have accumulated an off-site storage space quantity of stuffed toys and if you think about the amount of dust lurking in that plush pile, you may never sleep again. 5. There are buttons in baby clothes where you don't expect them. Before becoming a dad, I had no idea there were clothes with buttons in the crotch. They make changing nappies a breeze, but snapping those buttons shut on a wriggling baby should be a sport in the Olympics. A wise first-time dad goes into the experience expecting a fair amount of vomit, it's only natural after all, but he's probably not expecting it to project hard and fast onto his face at 2 a.m. By the way, it's warm, smelly, and every bit as disgusting as you'd imagine. 7. Baby food isn't bad. As a youngster, I couldn't have guessed that someday I'd be tasting spoonful's of pureed apple from tiny glass jars (which are adorable, by the way) but beginner eaters are helped by mirroring our behaviour. So here comes that little aeroplane with a spoonful for you and a spoonful for me! 8. You'll become a feminist. I'll admit to never really considering women's issues before I became a dad of a daughter. I have no recollection of ever discussing societal injustices or unequal pay with female friends growing up. 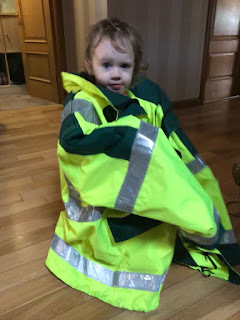 As a first-time dad of a little lady, I suddenly saw the stereotyping on toy store shelves, looked up at their potential glass ceiling, and became aware of everything that could hinder my daughter as she grew up. Like any good dad, I want to help her overcome and solve it all. If Mara wants to be Batman at Halloween then she can be Batman! 9. There's nothing quite like sitting in a quiet home with your little one. The hospital was a safety net with a comforting buzz of activity; assistance was only a button away. So I'll never forget the moment we brought our little bundle of joy home. She was sleeping and the house was still. We were alone with our new born and I didn't have a clue what to do next. The shaky confidence I possessed as a new dad quickly crumbled into a heap. There are no guidebooks, its one of those learn on the job situations. 10. You'll see yourself in your baby, more and more every day. I understood the DNA of it all, that half of her came from me but I didn't know being a dad would be like walking into a hall of mirrors. 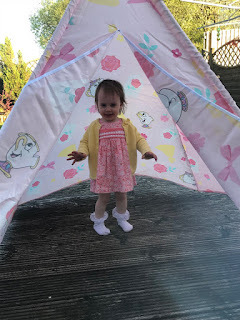 As I watch her sense of humour, imagination, co-ordination and general development of my first child reveal itself, I grasped that much of who we are – for better and worse – is transferred onto our children. 11. Your heart will be lighter — even with those extra pounds. My baby sleeping soundly on my chest is the most peaceful feeling ever. Her miniature breaths pushing her tiny belly in and out, the sweet smell of her wispy hair, her gurgles and giggles in her sleep; those memories will stay with me forever and are nearly strong enough to make me want to do it all again. Then I re-read many of the other items on this list and I realize that actually, I'm all set. Mara is perfect in our eyes, and you can't top that. Mums & Dads! What does every little Princess need? Her very own teepee!